After a long time with ADFS, because of the enhanced SSO experience for On-Premise users, I wanted to get rid of ADFS, as soon as it can be replaced. See the following steps I’ve done to get from ADFS to Pass-Through authentication. With this, I was ready for the cut-over, be aware the next step can bring some outage to the login experience of the users! This is due to the fact, that all users need to be converted from federated to standard. It only requires two powershell commands, but again plan this well, and don’t use this commands within business hours. The second command will convert the federated domain to a standard domain, where the password synchronization or the pass-through feature can be used. The execution time of this command really depends on the amount of users, that needs to be converted. Within a project last year, it took about 4 hours to convert 2400 users. If you plan a huge migration, I would recommend to get in contact with Microsoft to check options for reduce the amount of time. Afterwards, I was able to login immediately with pass-through Authentication and was not redirected to my lovely ADFS Page. But I was required to reauthenticate on services like OneDrive for Business, my Mail Client on the SmartPhone and so on. I highly recommend to use the full advantage of pass-though authentication by easily increase the redundancy of the server and installing more connectors. 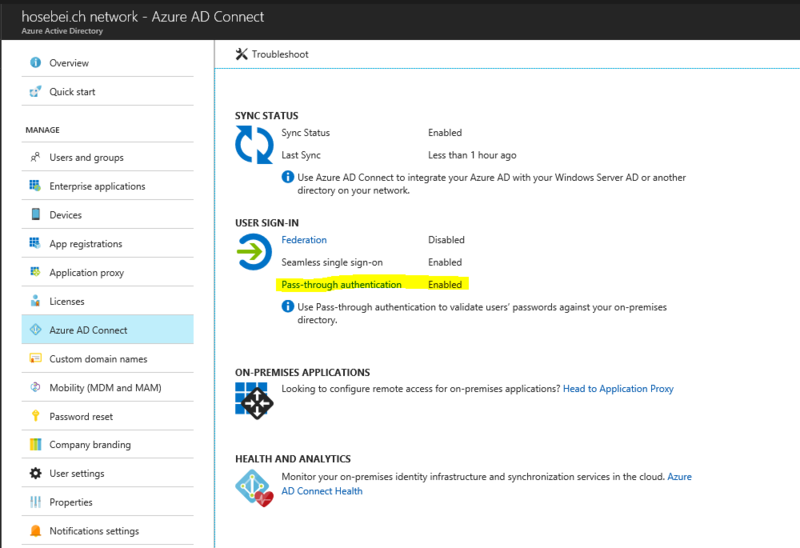 You can download additional connectors by a click on “Pass-through authentication” within the Azure Portal (see screenshot above). For more information about security, see this “Azure Active Directory Pass-through Authentication security deep dive” Article. no, as far as I know. Because you need to end the federation for a whole UPN-suffix in order to change. but you can test it with another UPN than your productive one, that might help?